I felt very privileged to be a part of the American Association for Cancer Research and their Survivor-Scientist Program. The goal of the program is strengthening the connection between the research scientists and those affected by cancer. I don’t belong to any other organizations, not even my own professional organization, but was so impressed by the AACR that I wanted to become more supportive and involved. I have applied to become a member of the organization as I truly value their vision and mission. Prior to my involvement with the AACR, I was asked to interview for a column in a magazine that featured a cancer blogger in every issue. It turned out the magzine was CR magazine, the CR standing for Collaborations-Results. The magazine is the journal of the AACR Scientist-Survivor Program. In a kind of fun coincidence, I didn’t know they were the journal of the Scientist-Survivor Program, and they didn’t know I had applied to attend the upcoming Scientist-Survivor meeting. I only learned that after I’d interviewed. The goal of the magazine is that of the Scientist-Survivor Program, to “strengthen collaborations and communications among cancer survivors, patient advocates, physicians and scientists with the goal of accelerating the prevention and cure of cancer”. My involvement in that process through the AACR has made those goals profoundly important to me. I was given several issues of the magazine to evaluate when I was asked to interview for the article. I loved the magazine and subscribed. It has a lot of credible and easy to understand information about ongoing studies and new findings in cancer research. It combines that information with inspiring stories and information about many of the surrounding issues we all face in living with a cancer diagnosis. I recently added a sidebar link to the magazine as it is a new publication not many are aware of yet. I learned today that because Congress has declared May National Cancer Research Month, CR Magazine is offering a free issue to those of you who would like to evaluate the publication. This isn’t an advertisement and I am getting nothing to promote the magazine, I just truly am impressed with the quality of the publication and it’s mission. I think we all need to stay informed and be part of the cancer research loop; this is a great avenue in that direction. I’ve met many of the staff on the magazine, and they truly believe in the mission of the publication. I’ve subscribed to professional nursing journals as I need to stay informed. I subscribed to this journal for that reason also, as a survivor and advocate I need to stay abreast of what is happening in the world of cancer research and advocacy. The magazine is a great link to inspiration and information for those of us struggling with cancer. Came to your blog from Google. 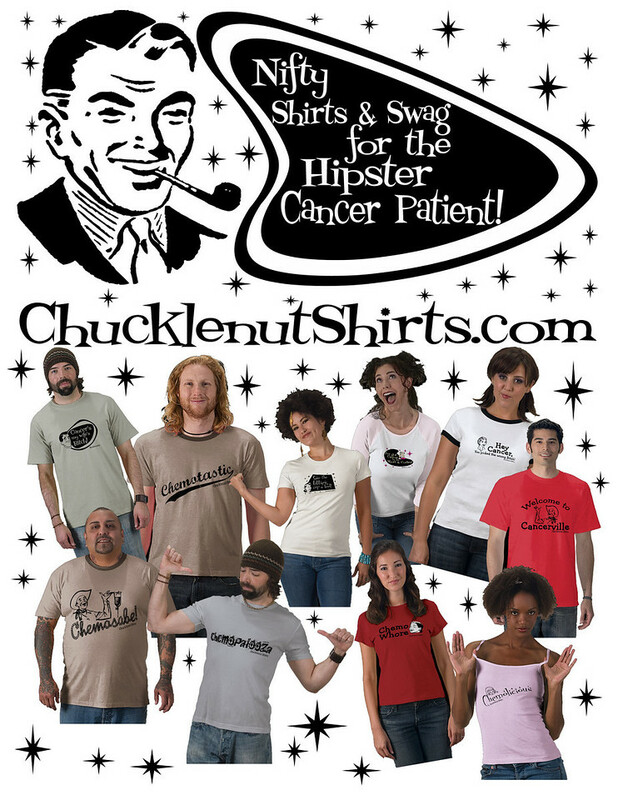 While laid up with 10 months of chemo for my fancy Stage IV Hodgkin’s I created an off color cancer shirt site, ChucklenutShirts.com. Wondering if you could give me a plug on your great website. A portion of each sale gets donated to cancer charities each month. Here is an image to use if you decide to.